The tragic cyclone that swept through Myanmar (Burma) last week caused 25,000 deaths. That disaster brought back my fond memories of our visit to that country a few years ago. We hope the gentle people of Myanmar will endure and rise from the devastations soon. 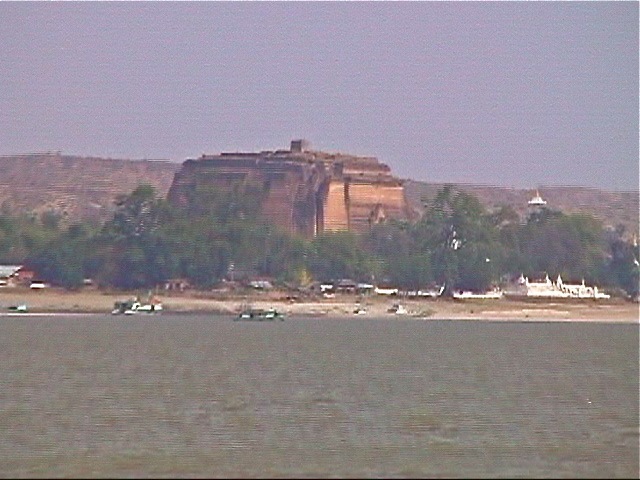 The plain of Began is covered with stupas. Some of them are slaborate works of art, the others more humble. They stretch as far on the land as our eyes can see. This bird seemed to have found sanctuary in the hand of a gold gilded buddha. 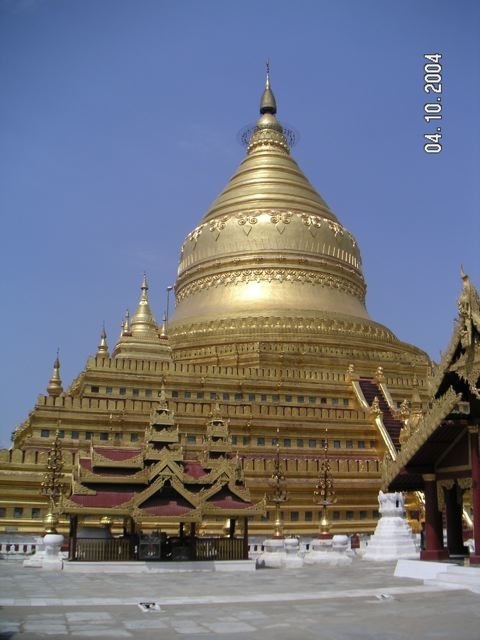 The gold domed stupa is situated in a temple. 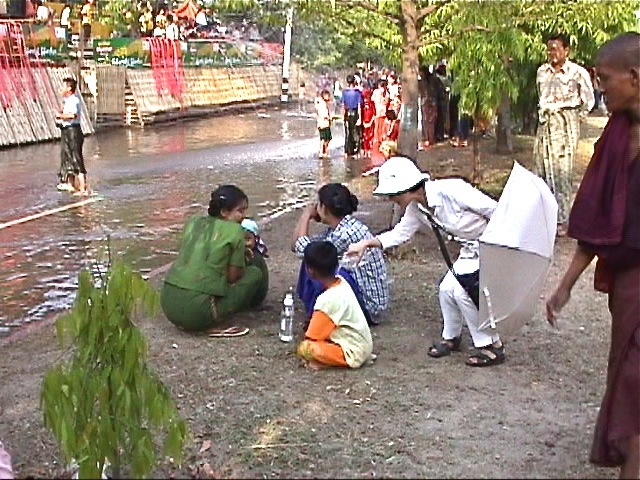 Our visit coincided with the Myanmar water festival. The whole country went into a happy frenzy of water splashing, a gesture of good wishes. 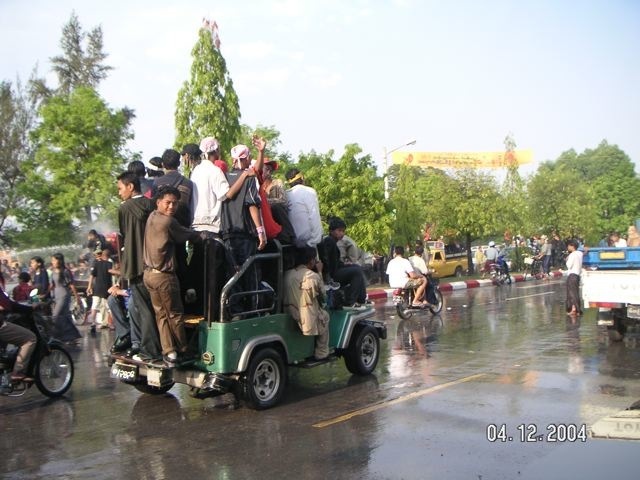 Young people rode around in cars and welcomed being hosed down. 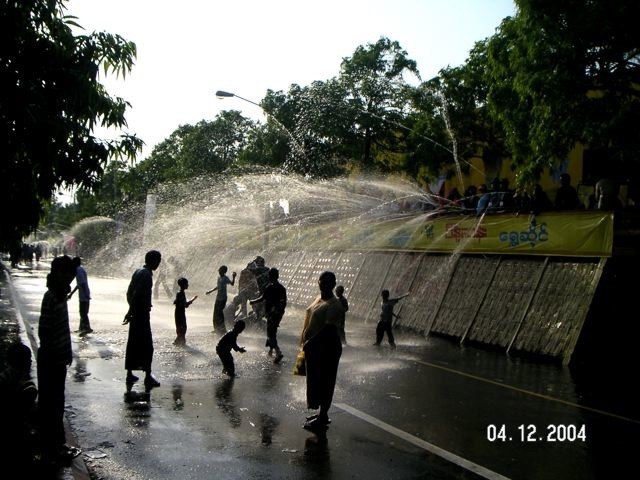 Pedestrians danced under the many hoses of water. Sally followed local customs and poured water on a child who happily accepted the offer. Young men victimized passengers of another boat by thoroughly soaking them with splashes of river water. One man ignored the festival and found solace in a quiet afternoon nap. 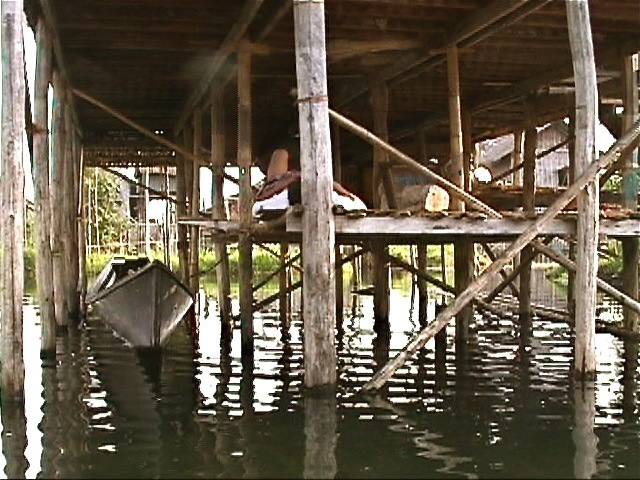 Floating vegetation were lashed together to form floating garden on a lake to grow vegetables. School girls danced in formation on streets. A professional dancer is more expressive and alluring. 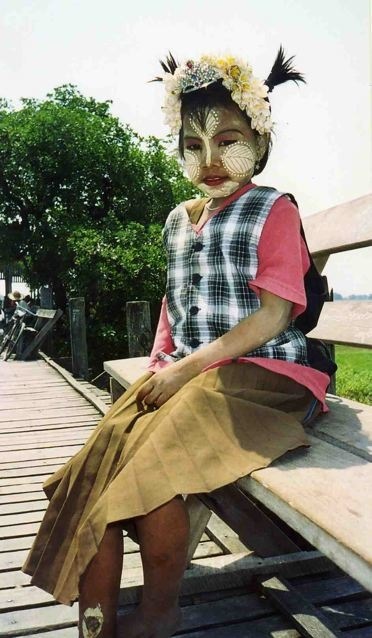 A child’s face is covered by a tree powder to ward off the strong sun. 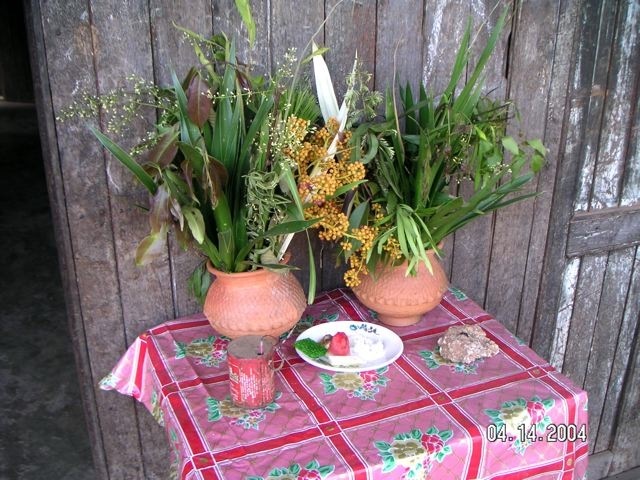 Mayanmar people are very religious and offering are abundantly displayed. As good will, jugs of water are placed outside houses for everybody’s use. 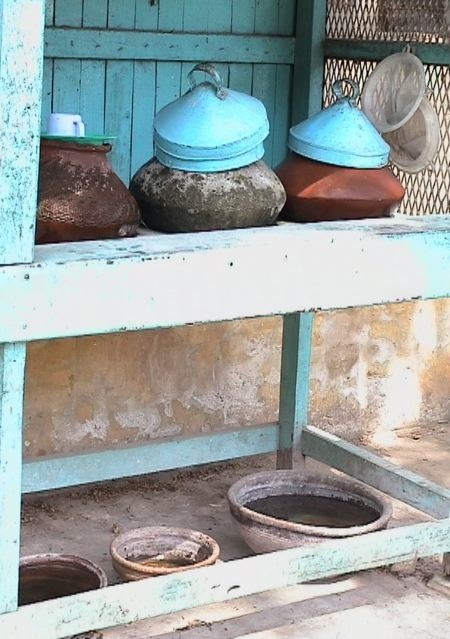 The terra cotta jugs are porous, allowing water to seep through and cool down the water by evaporation. 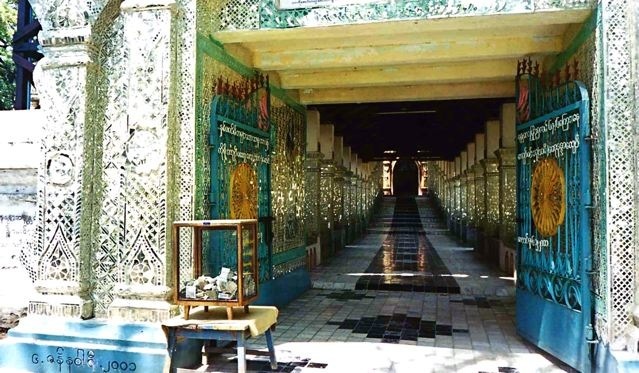 A temple is covered in mosaic of mirrors, lightening up the corridor. 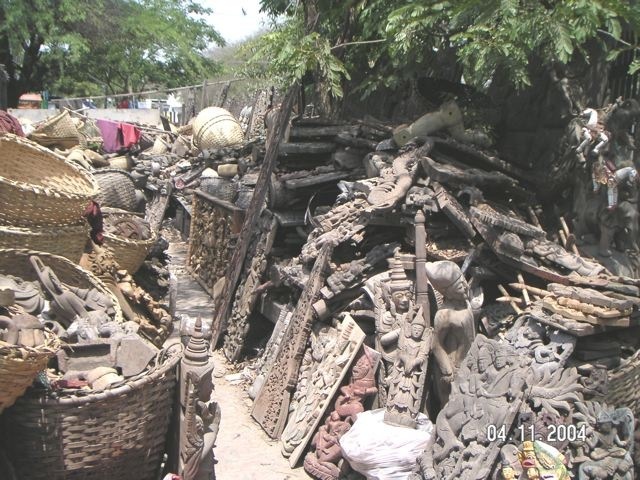 Piles of wood sculptures are left in the yard to be weathered and antiqued. Lunch time at a temple. 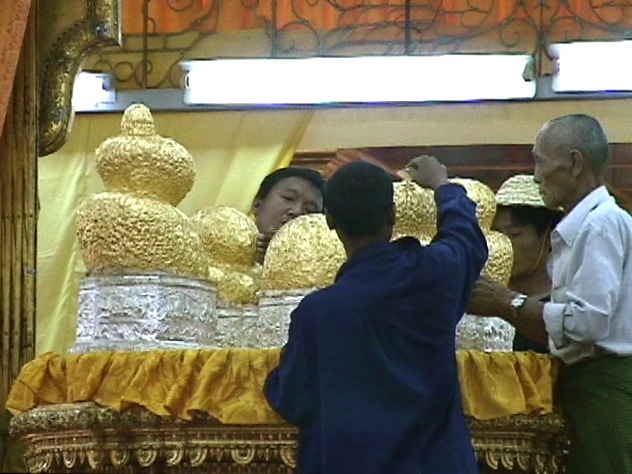 Monks line up to received food offered by local people. Young monks are grouped by age. A man cooks for the large number of monks. 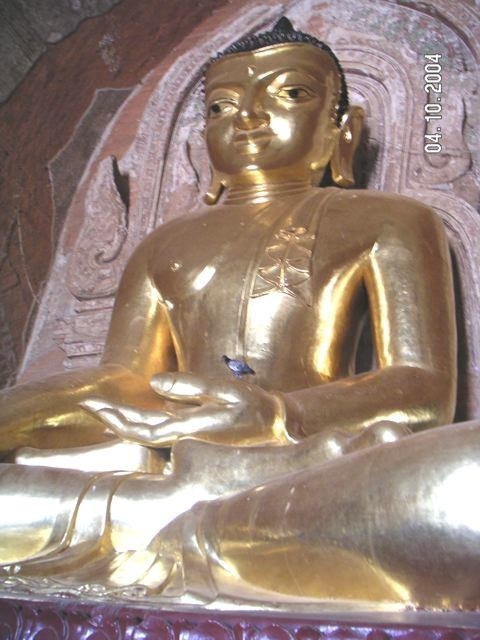 The faithfuls have been pasting gold foils on these buddha statues and completely hide their original features. 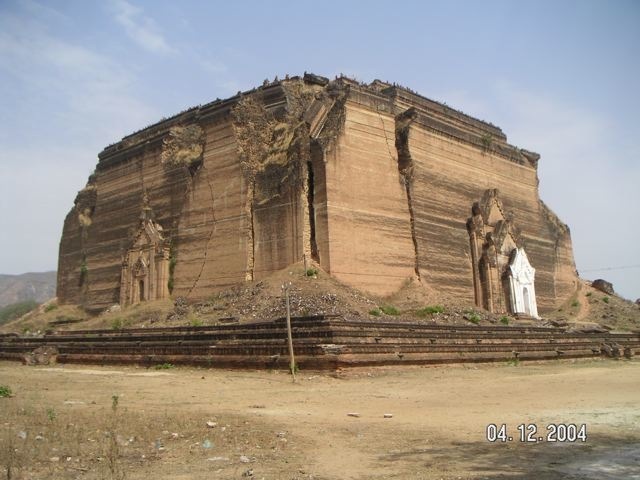 This is the monumental base constructed as the base for a humungous statue of buddha. The project by a egomaniac king was abandoned when he realized the task was impossible. The base is about two hundred feet tall. The completed statue would have to be as tall as the Empire State Building. Notice the size of the people at the gateway. 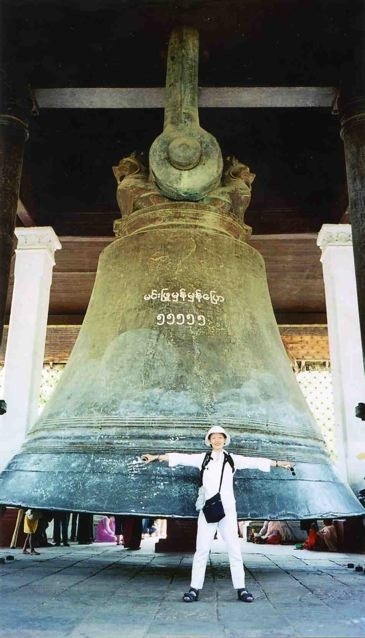 Another monumental project: A gigantic bell in a temple. Posted by Robert Wu on Tuesday, May 13, 2008, at 12:12 am. Filed under Uncategorized. Follow any responses to this post with its comments RSS feed. You can post a comment or trackback from your blog.